I’ve been extremely busy making all sorts of things; too busy, uncomfortably busy, but with things I love to do which makes me very lucky. I had lots of fun this past weekend building a cardboard castle for an ad job. And finished 2 new ships – pictures coming soon. Ooooh! Exquisite. My 10 year old son would love this! He’s been begging me to make a cardboard castle. He still can’t get enough of castles and ships. Beautiful work! Wow, Ann, that castle is amazing! You are brilliant! I am still saving for my ship! There are few words to describe your work simply devine sounds good to me. For two days now I have been thinking of making a cardboard castle. When I got home this evening and opened my email, there was the announcement of your cardboard castle. I had to laugh. I have not started mine, nor will it look like yours, but I thought is a weird coincidence. You castle is very nice too. The castle is lovely and the ship too!! Great job Ann!! Thats amazing (the castle) I’ve just landed here for the first time, so im off to look around. The ship is just beautiful! My boyfriend would now make this one of his Sunday “projects” now! HAHA it is really great. The Castle is fabulous, but of course my heart goes to the ships! I love those patched sails!!! Goodness I almost want to shrink down all tiny so I can live in that castle…well done. I take such delight in seeing each and every new piece you do! What a fun job! An amazing castle and I really love the ship! Your blog makes me so happy! Thank you. I just found you through a series of fortunate clicks! I love love love your cardboard castle …. The sails are fabulous – and the quilted look is probably how most sails used to look after a long voyage! I love them! I love that castle! I make cardboard castles all the time for my bunnies to play in but none are as amazing as this! Nice castle !!!! are you using glue or staples to put it all together? WOW. castles!!! THIS INSPIRES ME SO VERY MUCH. YOUR CREATIVE GIFTS ARE SOARING WITH THE CASTLE-FLAGS!! Wow! 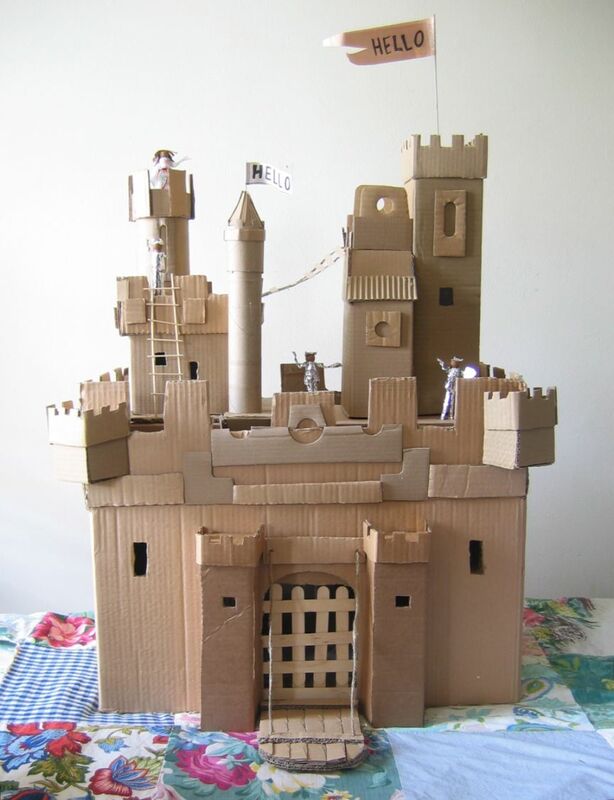 I am twelve and I have to make Castle of cardboard for a school project, would you be so kind as to email the instructions of how you made this beautiful piece of art? thank you for showing us how to make it. I made the same one but stuffed with candy to be a pinata for my daughter’s birthday. thanks for sharing such great projects. The castle was pretty spontaneous, using cardboard boxes, glue and hot glue. I just gathered some cardboard and began and one thing led to another.